Luan Gaines interviewed author Don Winslow about his novels The Winter of Frankie Machine , California Fire and Life and The Power of the Dog , his fascination with the setting of Southern California, and who between the mob and the government comes out on top in a "most dangerous" contest. Interviewer Luan Gaines: Where do you find inspiration for your novels? 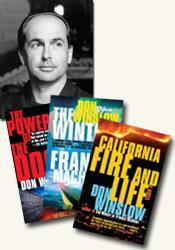 Don Winslow: Living where we do, when we do, there’s no shortage of inspiration. The problem is trying to find time to write all the novels swimming around in your head. Southern California seems to be familiar territory: the California-Mexican border ( The Power of the Dog ); Dana Point ( California Fire and Life ); and San Diego ( The Winter of Frankie Machine ). How significant is location in your work? Very. I’m fascinated by Southern California, in its geographical, cultural, economic and ethnic diversity. It’s also where the American Dream ends, where people go to reinvent themselves. It’s also flat-out beautiful. Your protagonists, Art Keller, Jack Wade and Frank Machianno, are deeply flawed, rebellious and independent. What particular traits do you require in such lead characters? They have to want something, and that ‘something’ has to come from some need inside them, usually related to the flaws you mentioned. They also have to have a sense of honor – it might not be the code that we share, but they have to feel it deeply and act in accordance. Mob life looms large in The Winter of Frankie Machine and California Fire and Life , also noted in The Power of the Dog . How do you research the dark secrets of criminal enterprise? Frankie Machine is one of your most dramatic characters, his old life reaching out to poison the present. How does Frank reflect the complexities of life and the consequences of the choices we make? In an almost Buddhist sense, we carry our karma around with us. Sooner or later, we’ll have to deal with the consequences of our actions, whether they’re positive or negative. Frankie’s no different in this regard. I think what makes him interesting is his specific mob past – and that he comes to realize that the mob code was nonsense and that he largely wasted his life. The Winter of Frankie Machine contrasts the old-school mob with the next generation. What are the generational differences and how would you explain the public’s love affair with the mob? Most people get out of the mob over generations, and move on to legitimate livings. Some don’t, and the kids who stayed in are not particularly the best and the brightest. There’s also a Darwinist factor involved – if an idiot marries and idiot, they produce... As for our fascination with the mob, I think it has to do with fantasies of power. On a fantasy level, it would be nice to resolve our problems and conflicts with a Brando or Pacino-like nod of the head. You know, ‘make it thus.’ The reality, of course, is far different, and most people wouldn’t do it even if they could. But the fantasy of power is intriguing. You tread easily on the dark side, but your protagonists inevitably have redemptive qualities that allow the reader to root for them. How do you balance the kind of brutality you write about with good storytelling? Well, thanks. Human beings are rarely one-dimensional. Most have bad qualities and good – redeeming – qualities. In any case, I don’t think it’s good enough to point at a character and say ‘He’s bad’ and leave it at that. I think you end up with a silhouette – a one-dimensional black figure on a field of our own lily-white purity. It’s boring. I think we have to at least try to see the world through that character’s eyes. We may not like or approve of the view – we rarely do – but we have to at least try to see it and show it. Which of your novels so far has presented the greatest challenge? How did you resolve it? The Power of the Dog , by far. It was an immense undertaking – five major characters over the course of thirty years, with the so-called ‘War On Drugs’ as the background. How did I deal with it? Painfully. It took five years to write (and re-write), and it didn’t break open until I found the real story – five people’s attempts to (with varying degrees of success and failure) to live decently in an indecent world. Once I discovered that, I was able to finish the damn thing. But, in all candor, I was really depressed by the time it was done. There is a common narrative that runs through your work, the underdog vs. against the odds. Agree? Disagree? What appeals to you in this particular dynamic? For one thing, it makes a good story. The deeper answer is that I really don’t like the ‘beautiful people’ and couldn’t care less about their much-publicized ‘struggles’, what color Mercedes they’re going to buy, their troubles with their nannies and personal trainers or their stints at five-star rehabs. I certainly think it makes for boring fiction. I come from blue and khaki collar people, and my interests and empathies are with people who get up in the morning, go to work, and try to make a life - and these corrupt politicians, thieving business executives and greedy #@%@^’s should be stood up against a wall and shot. Now, there’s an episode of ET that I’d watch. Okay, that was hyperbolic (I’m against capital punishment), but it was satisfying to type. You are a master of twisted endings. Do you plan these surprises at the start of the process or do such ideas evolve as you work? I have no clue what’s going to happen. God send I were that organized. Which is more dangerous in your opinion - mobsters or politicians? Why? What part does the government play in crime and corruption? How does government interference hamper or assist your protagonists in these three novels? Government or the mob? Which is more dangerous? Are you kidding? Mobsters only wish they had the power of compulsion, potential for lethal violence and license to steal that governments have. It would be their dream. You don’t want to get me started on this. I could – and, I guess, have – written volumes on it ( Power of the Dog , Frankie Machine ). But, briefly, no major crime organization has ever existed without the co-operation and/or compliance of politicians, and none ever will. Most of your protagonists are male, but in California Fire and Life , a woman emerges, nearly as impressive as Jack Wade. Are you planning to feature more women in future novels in other than supporting roles? Indeed, most of my characters are male, because I am. But I think I write strong women. Letty in Cal Fire , Nora in Dog , and wait till you catch Sunny in my next book, The Dawn Patrol . I like strong women – I’ve been married to one for twenty-three years. So far you have dipped into the ineffective War on Drugs, the pervasive tentacles of the Russian mob and related criminal activities in southern California and the entrenched mob mentality in San Diego, with ties to Chicago and Detroit. Are there any other relevant topics you would like to explore in novel form? Currently I’m writing about child prostitution. Have any particular authors influenced your work? All of them. In large measure, we are what we read. Since the publication of The Winter of Frankie Machine , you have been involved with putting your stories on film. Can you share a little of what has been going on in this regard? I’m only at liberty to discuss one – I’m making the film version of my first book, ‘ A Cool Breeze On The Underground ,’ myself, and am currently on the search for a director. It’s a fascinating process. Given that your protagonists share a love of surfing, it isn’t too big a leap to imagine it is something you love as well. Yes? Does being in the ocean help you focus, either on your work or on your life in general? Well, I’m a totally crap surfer. I mostly fall and swim. But I’ve been doing it in one form or another all my life. Mostly I do it for just fun, but, yeah, I think the ocean does help me focus and relax. There’s nothing like coming out of the water after a good session, taking a hot shower, being ravenously hungry for a good meal, and then crashing. Are you currently working on another novel? If so, can you share something about it with us? Yeah, it’s called ‘ The Dawn Patrol ’, and it’s about a group of surfers in Pacific Beach, one of whom is a P.I who catches a case that forces him and his friends to grow up and confront life outside the water. Write. I don’t mean to be glib. Writers write. I think that would-be writers sometimes get intimidated by the scale of the trying to write a novel. I’d tell them to take smaller bites – set a do-able number of pages a day to write (even if it’s only one page) and write it every day, no matter what, no excuses. They’d be shocked at how quickly they’ve produced a book. It’s a Nike thing – just do it. Don Winslow Don Winslow has worked as a private investigator in London, New York City, and elsewhere in the United States, and as a consultant to law firms and insurance companies for more than fifteen years. He lives with his wife, Jean, and son, Thomas, in Dana Point, CA and Riverton, CT.
Luan Gaines is a freelance writer and contributing reviewer to curledup.com. Her interview with Don Winslow was written in conjunction with her reviews of The Winter of Frankie Machine , California Fire and Life and The Power of the Dog . © Luan Gaines/2007.